A little of the old with a lot of the new! 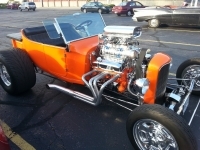 On the 2nd and 4th Wednesdays of June, July and August, from 5:30 p.m. to 8:00 p.m., the church parking lot on the north side of 19414 Detroit will be full of classic, antique, and custom cars, as well as great food, games for the kids, and music. Each night a valuable door prize will be given away. Each Car Cruise night has a distinct theme, and people who drive in the brand of the night receive free food and a beverage! Themes for this summer are June 8 - Ford Night, June 22 - GM Night, July 13 - Chrysler Night, July 27 - European Night, August 10 - Asian Night, and August 24 - Rat Rods Night. No charge for admission and everyone is welcome to these family-friendly events. Bill Cowles is Communication Ministry Team Leader, Rocky River United Methodist Church.